It’s no question that while Marvel dominates at the cinema, DC is at its best in other forms of media. From the acclaimed new Rebirth series in the comics, the amazing animated features, and the expanding CW universe, DC is still a force to be reckoned with. I was a latecomer to the television series, I caught on to Arrow through Netflix at the end of the second season. Luckily I was able to pick up on Flash right away and have bought into everything they have put out since then. With all of the series starting this year in at least their second season, here’s a few things I would like to see. I will be covering the endings of the previous seasons of these shows so for those not caught up there be spoilers ahead. Let’s start with the elephant in the room. Any good points that could be found were drowned out by the abysmal plot and boring flashbacks in season 4 of Arrow. It’s really a shame that such a wonderful performance from Neil McDonough was wasted in a strange plot surrounding magic that ended with a fist fight between him and Oliver. This puts a lot of pressure on season 5 to be at least decent and the promo pictures and trailers seem to convey a change in attitude back to the earlier seasons. Executive producer Wendy Mericle has already said that the main villain for this season, Prometheus, has ties back to season 1 so we may finally see the return of the little book of names. Either way I’m still hopeful for season 5 if for nothing other than the new group of heroes that Oliver is training. The long awaited team up show, Legends of Tomorrow, may have gotten off to a rocky start but quickly grew on me. I love to see Victor Garber in such a strange role and the mix of Captain Cold and Heatwave has made for some great comedy as well as turning the throwaway character of Chronos into a really great twist. This show spent the majority of the first season just setting up the team and their relationships with each other so I can’t wait to see a full season where they are a complete unit fighting some greater evil. Given that Wentworth Miller has signed on to be a regular on this series as well as the Flash, I’m excited to see how they get his character back onto the waverider. Speaking of the Waverider, when the first questions came down about possible future crossovers between the Flash and Supergirl, which currently takes place in a different universe, the showrunners made it clear that the Waverider could go anywhere including traversing the multiverse. This could be the way they bridge the gap between Supergirl and the rest of the CW universe but that’s not even a focus of this season. I stayed committed to this show because of how awesome Melissa Benoist performed at bringing that character to life and I am really glad that I did because that red kryptonite episode really gunned the show forward. It did, however, suffer from not only being a little too cheesy while attempting to exist both in the Superman Returns universe as well as the current TV universe. It looks like that is all changing this season as they are not only making Superman a periodic character but introducing Mon-EL as the mysterious person in the pod, Lena Luthor, and Miss Martian. One thing that I was worried about was continuity with the change but it seems that Project Cadmus will be the major villain of this season which is a huge carry over. As someone who put in my time with the show while it found its footing, i’m expecting some great things from this show in the coming season. As for the flagship, the show that is really pulling in the viewers, the Flash returns to deal with the effects of his choice to change the past and save his mother. I have made no effort to hide the fact that the Flash is my favorite superhero and this show has delivered everything I could have wanted from episode 1. As we know, the comic deals with Barry’s choice to change the past pretty severely with the Flashpoint universe but I doubt we’re going to see a blood crazed Gal Gadot and Jason Mamoa waging war across the earth so i’m alright with them setting up their own version of the changed universe. According to reports the entire season will not be stuck in this messed up world but the special 4 episode crossover with the other shows are supposed to hinge on the changes in Flashpoint so it will not be resolved right away which was a major fear for me. With the absence of the Atlantean and Themysciran war, I wonder what major world event will cause the need for Barry to change the universe back. In any case, the fact that Thawn has returned to face him in this universe is super exciting. I just hope Tom Cavanaugh makes his way back into the series. Other than the Walking Dead, these are the only shows that I really watch right when they air and I look forward to them every single week. I did leave Gotham off of this list as I really didn’t enjoy the show when I first watched it. I guess now that I write for a media outlet I should give it a second chance but as of now I’m not a fan. But I have talked enough, what do you think? 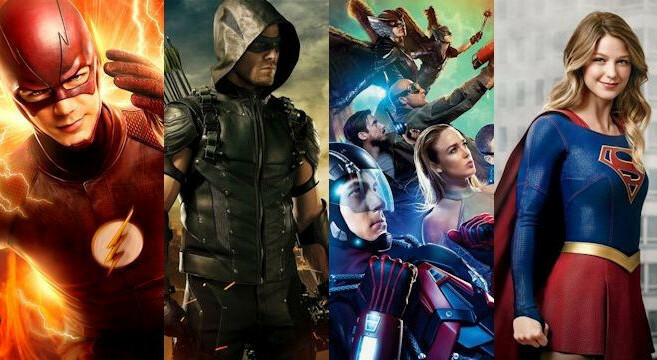 Are you excited to see a more in depth and connected universe across four superhero shows? Are you as excited as I am to get almost a new show every day of the week? Let us know in the comments below! The Wampaslayer Podcast – Episode 46 – E3!